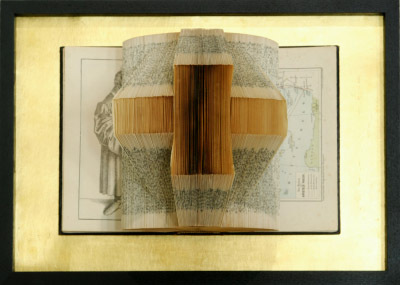 Technique: Folded book with a golden passe-partout (genuine beaten gold); black lacquered wooden frame. Description: A black frame with a golden inner edge encloses the gold plated passe-partout; onto which the bible has been mounted. The pages in the middle of the volume have been folded into one transverse and two lengthwise bars. So the ensemble forms a cross. In times almost nobody dares to put up this symbol this object provides the spectator the opportunity to immerse himself into the Christian creed and the church in a very personal and profound way.